Like I said last week, I’m totally into ramen right now. Mmmmm… Just writing that makes me think I should get some for dinner tonight. Sounds like a plan! I’ve recently started experimenting to see if I can accomplish a fair version at home. First round, I’m going to call it a success. Was it perfect? Nope. Was it good? Yes. 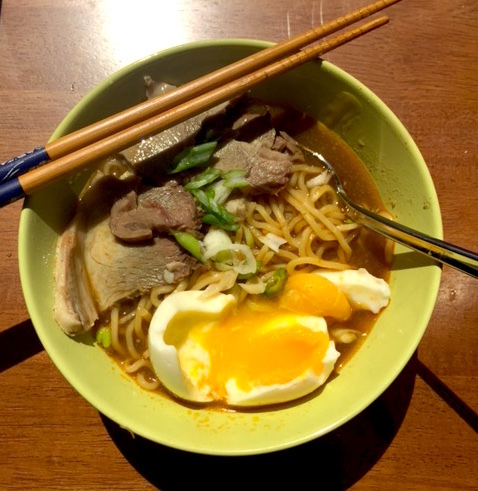 The recipe I used described this as a basic ramen broth and that is what it was. Basic. 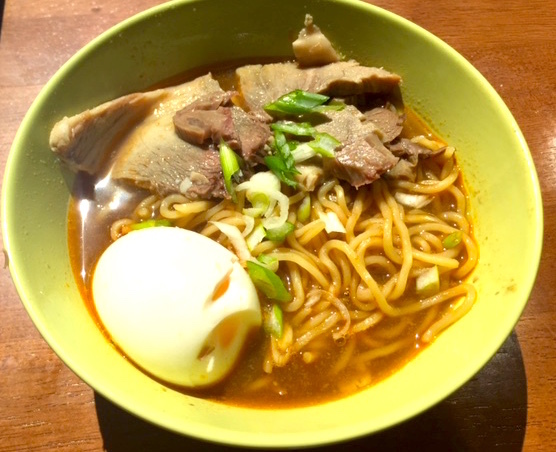 Easy, yummy, but lacking the amazing depth and range that a true ramen house can give you. And you know what? That’s ok. I plan to explore this ramen thing further. But in the meantime, I can make a pretty good bowl and you know what? So can you. When I said this was easy, I was not kidding. Slow cooker easy. Only thing? You probably want to make it the day before you want to eat it. I’ll explain. Load up your crock pot with pork, ginger, onion, garlic, mushrooms, green onions, and the cover with chicken stock. Cook on high for 5 hours. Cool overnight. Now, make soft boiled eggs. Carefully place raw eggs in boiling water and let cook for 7 minutes. Scoop out and run cold water over them. Peel and set aside. Let’s assemble! In a large bowl, place a generous amount of noodles. Lay on a few slices of the pork. Add a soft boiled egg. Pour hot broth over the ingredients. Top with sliced green onions. You don’t have to wait until the next day to eat, but if you don’t, you will have shredded pork instead of the nice thin slices. After so many hours of cooking, the pork will be fall apart tender. If you are cool with that, shred some up for your ramen. But, if you cool the pork, and cut it cold, you’ll get the pretty slices. Don’t store cooked noodles in the broth. They’ll get soggy. Just make however many bowls you want at a time and store things separately for leftovers. That being said, if you store your leftover broth in a pot, the next day you can throw it on the stovetop, get it boiling, toss in your egg and your noodles and cook it all up at once. Just make sure if you have leftover stock after that, that you got all the noodles out, because like I said, soggy.